Antique Gilt Bronze Oval Jewelry Box or Casket. Very High Quality. Circa 19th Century. Fully Lined. 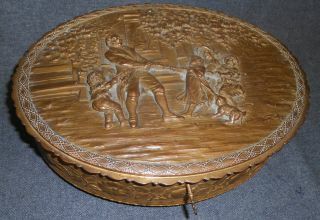 Wonderful relief scenes all around as well as a Lovely Family at Play Scene on the Lid. Measures 11" x 8-1/4" x 3-3/4" tall. Condition is very good. Silk Liner has losses. Serious inquires Please contact us. Click on Picture to see additional photos.